Bute County was a Piedmont North Carolina county between 1764 and 1779. It was named for the Earl of Bute, the prime minister of Great Britain during the reign of King George III. In 1779 Bute County was divided into Franklin and Warren counties. The Bute County courthouse was located in present-day Warren County, about eight miles southwest of Warrenton. 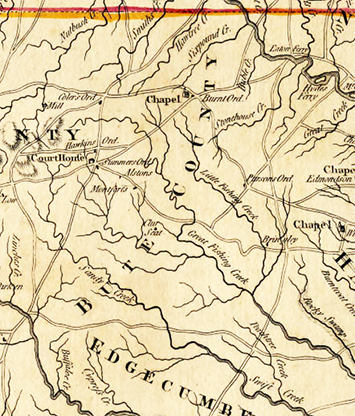 On June 10, 1764, the North Carolina General Assembly formed Bute County from part of Granville County. The new county was incorporated to provide the residents in the eastern parts of Granville County, specifically St. John’s Parish, better access to county government. Bute County was expanded in 1766, when part of northwestern Northampton County was annexed. The popularity of the Crown in Bute County had declined significantly by the late 1760s. The Earl of Bute was blamed personally by many North Carolinians for institution of the Stamp Act in 1765, and was hung in effigy. Royal Governor William Tryon’s call for troops to fight the Regulator Movement in 1768 was ignored by the Bute County militia. 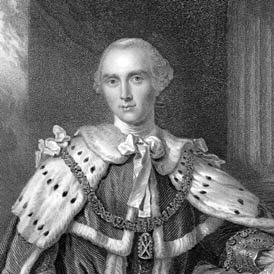 In the early 1770s, it was commonly claimed that, “There are no Tories in Bute,” and there is little evidence to dispute the statement. With the declining popularity of the Crown and of the Earl, as well as the increasing county population, support grew for the division, and renaming, of Bute County in the mid-1770s. Following the Provincial Congresses of 1775 and 1776, Bute County representatives proposed an act to divide their county. After two years of discussion, it was divided, generally along the Shocco Creek, into two parts: the northern county of Warren and the southern county of Franklin. With the incorporation of Warren and Franklin counties on January 20, 1779, Bute County ceased to exist. The Bute County courthouse stood to the southwest of Warrenton, built on land donated by Jethro Sumner, a brigadier general in the Revolutionary War. It was located on a tract of land called “Buffalo Race-Path.” The courthouse no longer stands. "John Stuart, 3rd Earl of Bute." N.C. Highway Historical Marker E-19, N.C. Office of Archives & History. http://www.ncmarkers.com/Markers.aspx?sp=Markers&k=Markers&sv=E-19 (accessed June 7, 2013).